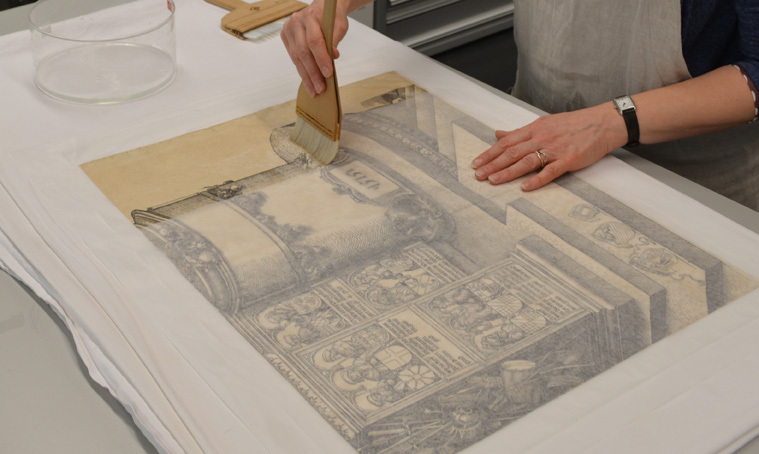 As the project to conserve Dürer’s Triumphal Arch reaches the final stages Sam Taylor and Agnieszka Depta work with the Hirayama Studio to prepare the print for future display. 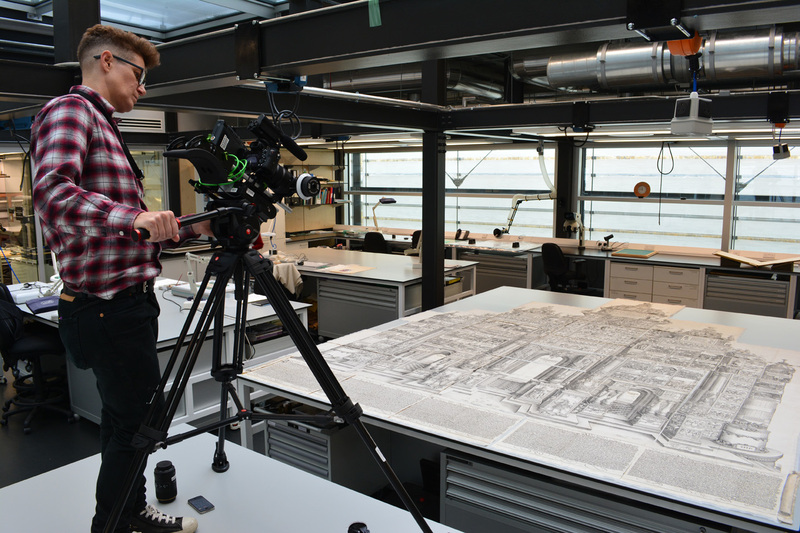 Melanie Malherbe filming the reconstruction. Once we had finished washing all of the sheets (which you can read about in the previous blog) we laid them out to get an impression of what the print looked like as a whole. A few sheets were then singled out for more cleaning due to ingrained dirt. Having established a tradition of experimenting with unusual tools, we used very fine cosmetic brushes (intended for cleaning nose pores on humans) that are softer than a squirrel’s tail. 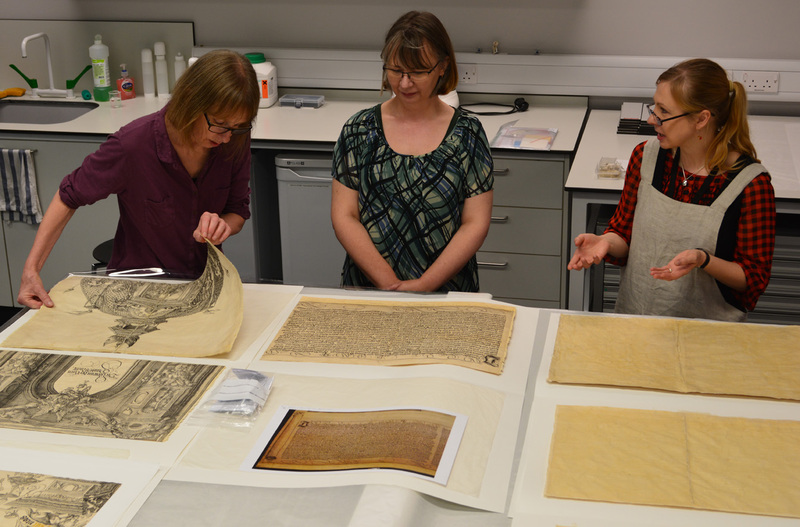 Conservators Jude Rayner, Caroline Barry and Sam Taylor comparing sheets of the Triumphal Arch. The washing process presented a good opportunity to reduce some of the creases by gently brushing the wet sheets flat between thin, non-woven polyester layers. At this point it was important to make the distinction between creases that were created during the original printing process (those ones got to stay) and to focus on flattening the ones that happened while being handled or lined in the past. Re-sizing one of the sheets. 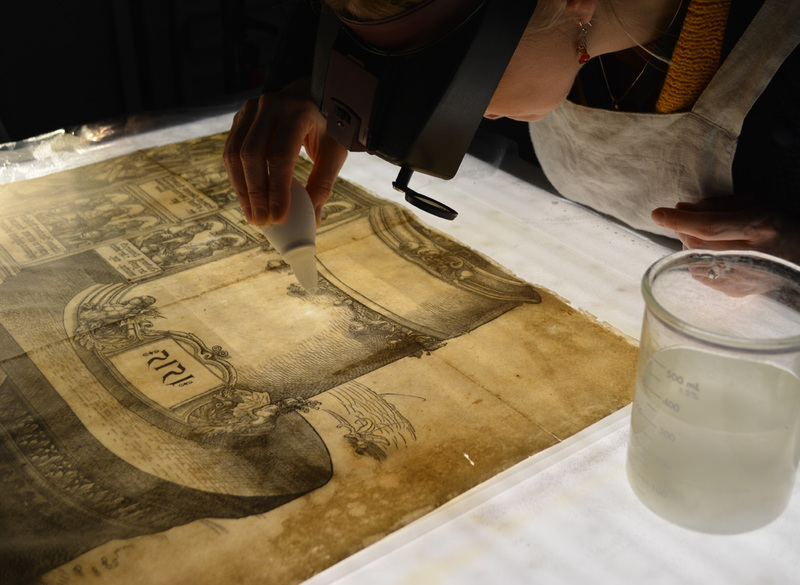 To help strengthen the paper after washing and to make sure it is fit for study and viewing for at least a century, we applied a sizing solution through protective tissue with a soft goat’s hair brush, ensuring an even application. 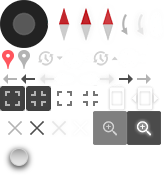 Finally, it was time to carry out some repairs. Simple tears were repaired with Japanese tissue and wheat starch paste. Losses and skinned areas were repaired with a technique called pulp infilling. We used white pure cotton paper with small amounts of blue, yellow and red-dyed paper in precisely weighed out proportions to create an off-white paper that matched the tone of the original sheets. 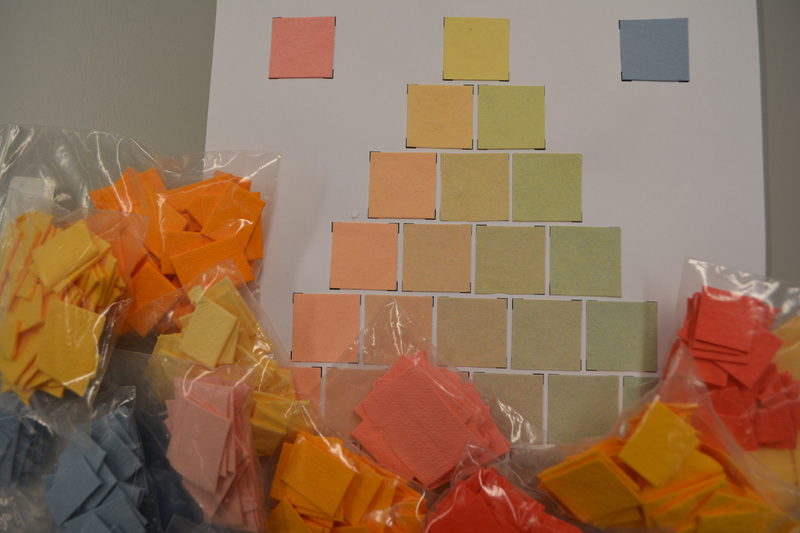 Dyed paper and colour chart. Photo ©Alan Buchannan. In keeping with our practice of using unusual tools, we used a nasal aspirator to apply the pulp. This was done on a suction table, which pulls the water from the pulp through a smooth, porous sheet, leaving a latticework of fibres behind, magically transforming into strong paper upon drying. To add to the atmosphere, most of this work was carried out in the dark in order to see how uniformly the pulp was being applied in the faint glow of the suction table’s transmitted light. A print of this size won’t be strong enough to support its own weight when hung vertically, so we needed to give the sheets some extra support by lining them. 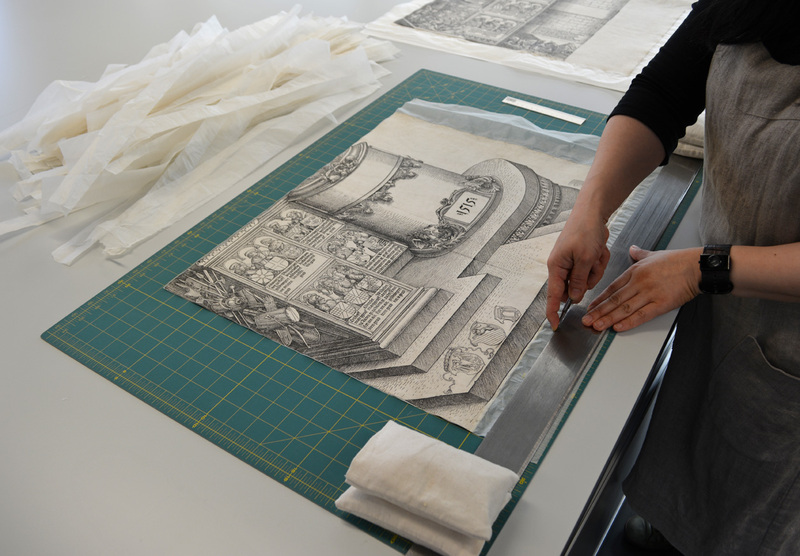 Choosing the right paper to line a print with is an important decision; we wanted a paper that would compare favourably with the quality of the 500-year-old paper commissioned by Emperor Maximilian I. It also has to give the right amount of support and, as it will be in contact with the Triumphal Arch for a century or more, we have to make sure it won’t be damaging in the long term – unlike the previous textile lining (you can watch a video of the old lining being removed here). 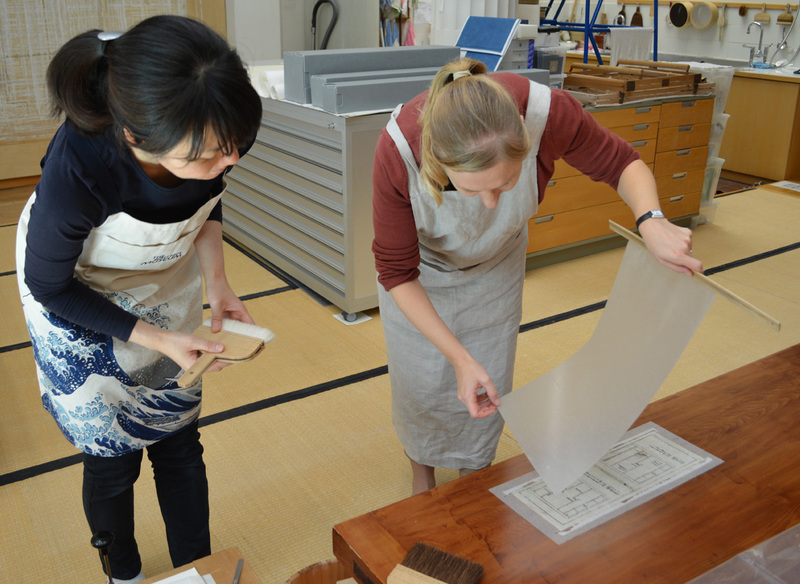 Japanese papers are often used by Western conservators, as we admire their strength due to the long fibres in the paper. Luckily for us, we have our own expert in Japanese papermaking at the British Museum: Megumi Mizumura. With her advice we chose a very strong but light, handmade paper that is free from the impurities that make many types of paper deteriorate, and placed a special order with a traditional papermaker in Japan. As we were using Japanese paper, it seemed sensible to consult the experts on how to apply the lining. The Museum has a studio specially designed for conserving East Asian works of art on paper and silk: the Hirayama Studio. Conservator Kyoko Kusunoki joined the Museum last year and was kind enough to give us training in the some of the specialist techniques used in lining Japanese scroll paintings. Working in the Hirayama Studio takes a bit of getting used to: there’s the Tatami mat flooring which requires working without shoes (note to self: wear best socks), and a lot of kneeling, as Japanese workbenches are low-level. Conservators Kyoko Kusunoki and Sam Taylor lining in the Hirayama Studio. Once we got the hang of it, we set to work applying the techniques we had learned to lining the Triumphal Arch with the selected paper. The Japanese method involves applying a thin layer of wheat starch paste with a special brush and lifting the now wet paper with the aid of a stick. As with many Japanese techniques there is a particular way of holding the stick, which I kept forgetting – I managed to memorise the correct position by imagining I was looking at my watch. Positioning the paper is tricky, as is brushing down the lining paper without getting any wrinkles, requiring no small degree of coordination. Holding the stick at the right angle with the left hand and brushing with the right hand, is as difficult as patting your head while rubbing your belly. After applying the lining paper, we left the lined sheets to dry under a cosy felt blanket to keep them flat, and once they were dry we trimmed off the excess lining paper. As we had recorded which edges were overlapping, we could trim the lining paper so that it won’t show when it’s reassembled. The sheets will be stored individually until such time as it will be reassembled. We couldn’t resist seeing what they looked like en masse, so to mark the end of this stage of the project we asked Melanie Malherbe, a member of the Museum’s broadcast team to film us laying the sheets out on benches in the studio, but putting the jigsaw back together again properly will be a whole new story!